Rod just pointed us to Sharesight – a downunder focused portfolio manager website. The website looks to be yummy goodness – simple to use and so forth. I was initially pretty skeptical though – what use is another portfolio manager when you can do things pretty simply yourself, or with the likes of Yahoo? I set up a fake portfolio for Australia/NZ in about 3 minutes. It lets you enter in the date that you acquired the shares, and will calculate the total return for you. You do need to remember how much you paid for it though. You can create your own view of your portfolio, and, of course, plonk it on your myYahoo home page – handy if you use Yahoo mail. Pretty nice – and free, but old school. Google‘s offering is stunning. Not only is coverage of NZ (and Au) shares now there, but it is a much more web 2.0 application – dead simple to use. From an investor point of view – i.e. “how are the companies that I invest in doing?” the tools are excellent – with fantastic news sitting beneath flexible and comprehensive portfolios. You can add in transactions (with dates) and track overall performance on you iGoogle homepage – which, unlike Yahoo!, I actually use. 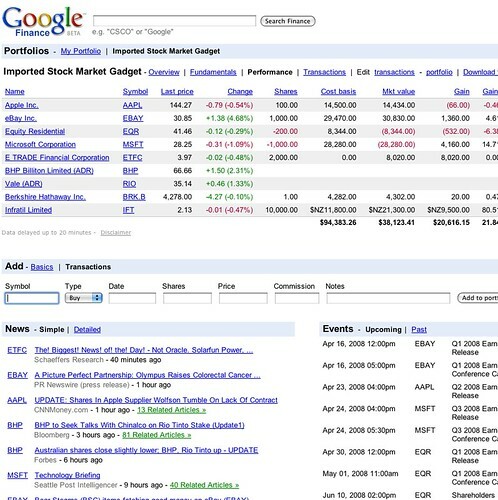 It doesn’t seem to bring in historical dividends, and doesn’t track options, but watch this space – Google moves fast. Overall I’m gushing – but really this is a lot better than ladt time I saw it, and perhaps even better than my own etrade account. Best thing – Google tracks when earnings releases arrive, and you can add them to your google calendar. How simple! 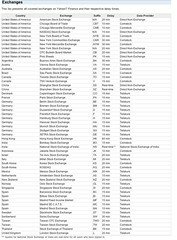 eTrade (US version) lets me track stocks across 5 different countries – NZ (or even Australia) is not one of them. eTrade shows me my portfolio, including options, with market values and different views. Additionally they have plenty of tools to track performance, though they could be better as I don’t get credit for timing my moves in and out of the market. It’s also a US-centric website, and as such everything is based on the US tax year – which is the calendar year. Running my NZ tax this year is going to be entertaining – though I can easily export my eTrade Transactions to excel and go from there. And that’s where Sharesight has a market. It’s a great way to handle working out your NZ capital gains tax on your investments in Australia and NZ. Overall the website looks entertainingly useful and fun. Plomk in your purhcase dates and amounts, and Sharesight calculates all the splits, dividends, tax credits and the like to give you an overall portfolio return. Check out the Sharesight tour and video. However – it is not all that useful yet for investors that invest in other lands – and we all should be doing so to have a diversified portfolio. There is space of course for sharesight to expand to accept transactions and calculate tax liability from other markets. So when Sharesight brings in foreign (US) stocks I’d be keen to give it a go. But not at the current fees. At the current fees I’d simply sign up for a month at the ned of each tax year, work out the tax and then get out straight after. There seems to be no benefit (and certainly a cost) from using Sharesight for day to day management versus either Google or your own online share broker. Moreover the fees are tiered, and those top tiers are brutal, and kick in at very low usefulness Who owns less than 5 shares? who doesn’t want a tax report? I’d chop them up and make a single tier, give an annual fee option along with the monthly one and forget about charging $39 for stuff that is “coming soon”. I also believe that the appetite for fees is much lower than portrayed. I’d be going along the lines of $10 or $20 per year, $50 at a stretch. That’s the other pain – I wish that Google and eTrade could play together so that my transactions could be imorted from eTrade to Google. Similarly Sharesight is hopefully working on one click importing of whatever the local online share trading houses export. I have only a few stocks, but for someone with s portfolio of 20-30 stocks, purchased at differnt times, it would be a real pain to enter them all in. Of course it would be even more pain to work out the tax without Sharesight. 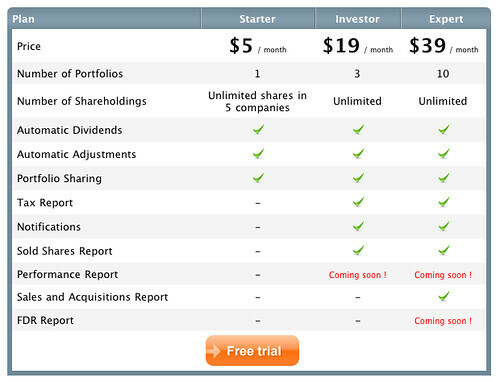 So overall if I had an NZ portfolio of stocks I’d probably use Sharelight next month on the 30 day free trial to calculate my tax liability – and then not sign up. I believe that the pricing structure is all wrong – a yearly fee is better, and it should be around $20. However the market is pretty small. The number of people in New Zealand that want to manage a portfolio would be a percentage of the number of people that go to financial sites. There were about 31000 UB’s at directbroking, 22,500 at interest.co,nz and a paltry 15,000 odd at sharechat.co.nzduring February. I’m assuming naively that The directbroking customers have some sort of tracking tool, but that it isn’t great and so a percentage of people will come over. Let’s be wildly generous and say 10% come over. That’s 3,000 people. The sharesight blog implies there are 730,000 shareholders in NZ. That’s a bunch, but most of those would be passive, suing someone else to manage their portfolio, or dead (literally). The Sharesight service is aimed at more active and engaged traders. So let’s say they can get 5% of the overall shareholders in NZ – that’s about 35,000 people. ok – so from 3,000 to 30,000 people at, for me, a fair price of $20 per year – that’s $60,000 to $600,000 per year. If you believe in the $20 per month model, then multiply that by twelve to transform that $20 per year to $20 per month, and we get $720,000 to $7.2m in annual revenue. That upside would be much much lower at that sort of pricing – so my range would be more like $60,000 to $1m per year in the first years. That has to support 4 owners/directors/principals and an outsourced interaction/ development firm. That’s means not a lot of custard to start. Launching into a massive bear market isn’t going to help – people trade a lot less when the market is falling. Firstly, and obviously, it’s around getting more customers – either Kiwis with overseas portfolios, or overseas folk. The second one is tough, as Google is tough to compete against. More customers means more subscription income, and this is an easily scaled business. Secondly, with their great usability I’d sign up very quickly if they extended into being an online broker – allowing me to trade shares. that’s a different busines model, but they’d take a chunk of the market pretty quickly. Thirdly – there’s an obvious exit to a broker or to an internet business media player. Finally – there is something about Sharesight being a custodial system. National bank are about to start changing a staggering 1% of portfolio value for “Custody fees”. That’s a significant amount, and if Sharesight can bring people over then it is game over. They seem to think they can, but they need to really spell it out for people in single syllable words. Well done guys – lovely execution, a business model with potential and some good PR to kick things along. Fix the pricing though. I’ve been using the Sharesight beta for the last few months (for free) but won’t keep using it when I have to pay. I only own shares in one company and although I like the weekly summary emails, and the price alert emails (when the price jumps up or down by a certain amount), I won’t pay $60 per year for the service. I think the Starter package should be free and ad-supported (they could even include an ad in the emails) as I can’t see how anyone with shares in less than 5 companies could justify the $60 per year to monitor them. Thanks for the write up Lance and taking the time to compare Sharesight vs Google and Yahoo. We have always maintained that for a portfolio system to be of any use to a serious investor, it must provide annualised return figures which neither Google or Yahoo do. This is crucial in order to compare the performance shares against each other over time or to compare your portfolio as a whole against other investment opportunities. For example, being told you have a capital gain of, say 30% is meaningless if it does not factor in whether you have owned the share for 6 months or 3 years. Furthermore, it it vital that dividends and currency movements are factored into the return data to give a true picture of your returns. This is where we believe Sharesight has a substantial point of difference over other products on the market, not to mentioned the full historical information and tax reporting that you picked up on. A final point of particular relevance to more serious investors is that Sharesight fulfills the accounting requirements of trusts, share groups and companies that invest in shares. We appreciate your comments re pricing and you have sparked an interesting debate on this (from our point of view anyway). We would love to hear some more feedback on this from other people as well. We are committed to coming up with a pricing model that investors are comfortable with. We have had a wide range of opinions on pricing ranging from your comments above through to people telling us that we have priced it too cheap! It’s worth noting that to get the same information that Sharesight provides prepared for you by a professional full service broker will almost certainly cost you significantly more than a Sharesight sub! But having said that we do appreciate where you’re coming from, and we would love more feedback on this. -We will be offering an annual payment option on all plans, with a 10% discount for annual payment. -We hope to expand the site to include other international exchanges, however this will likely be a least a year away. I’ve been to see the Sharesight crew and was very impressed with the service. I had just been in the US and had a chance to catch up with Anton Commissaris at Mint and see systems like CakeFinancial.com both of which gave me ideas around creating financial platforms to meet all our needs. Like Stuart, my main issue would be cost but as Scott says its actually quite cheap. We are so used to using internet platforms for free that we often balk at paying upfront fees for something new. I like the idea of an online broker attached. I’m probably in the 5-10 stocks bracket and could stomach $50 a year for the service but it may appeal more the the bigger user. Still its a great platform with lots of room for development. I think the business of becoming a custodian is far more involved than you imply and really is a game of global scale. 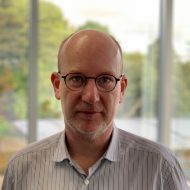 The range of services provided for that 1% by NBNZ involves performance & tax reporting, access to international markets trading (for equities, exchange listed options, don’t think they have any derivative functions), dealing with the nightmare that is managed funds, clearing services, managing corporate actions, fx. All these are complex systems requiring development and exposure to risk if you get the final product wrong, or the system isn’t as good as described to clients. This business already has many competitors, NBNZ, Etrade Australia, I think State Street are in NZ. Most brokers offer a custody service. Also the fact is these companies need to be large to be viable. FNZ, the company powering the platform for NBNZ really only became worthwhile when extending the software to the UK market. I think Sharesight if they have aspirations to do this, are in a market with definite opportunity – the custody services provided by big banks are lamentably poor and performance and fees from managed funds disembowel any return. But then, sophisticated and savvy retail investors can just sign up to CMC Markets giving them live information and access to exchange-traded derivatives. Less sophisticated investors may use the basic financial information but may be less involved volume-wise to make the business feasible. Also like any banking system surely there is quite a level of inertia to overcome to get customers to buy. Alternatively Sharesight may wish to become a client of a custodian to tack on these services and take a margin. Might not be a bad outcome. But what it really comes down to is surely attention and getting people using the site. Being the meat in the sandwich of client expectations and dealing with registrars/fund managers can be less than fun. I own shares in less than 5 companies! Aside from making me a loser, it also makes me a potential target market at the very low end. The pricing put me off completely, and I know it’s for ‘serious investors’ but I know people who have a lot of money invested (which I assume makes them fairly serious) and have no analysis tools and the look and feel of the website gave the impression it was an easy in for people in that boat to stop using newspapers and start doing ti properly. But the pricing cuts out everyone but uber serious investors who wont make ANY sacrifices in their analysis tools. So I will keep not knowing what is happening with my investments.